To shut in or to seal in or to fence in or to hem in or to enclose or to surround or to blockade a group of stones: these are flavours of a core aspect of Go, the surrounding game. Mostly, shut in, seal in, fence in and enclose refer to a group which is half surrounded by the opponent, half facing corner or side, moreover in a severe way, whereas surrounded is more general. A general opening principle is not to allow for your stones to be shut in: avoid being sealed in. 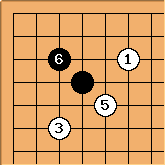 , tenuki (see Joseki-related life-and-death example 4 for the continuation). 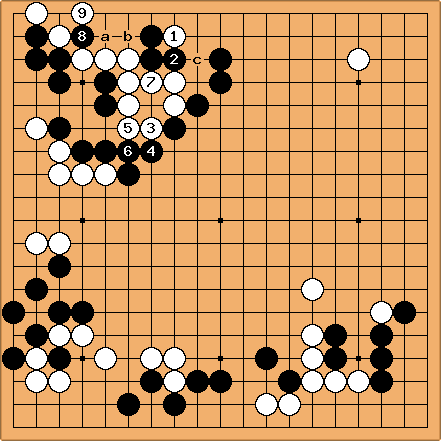 This example comes from a game between Nakamura Doseki (White), and Hayashi Monnyu. allows to seal White's group into the top left corner. is a tesuji that allows White to make a direct ko for life. Bill: I still think this page needs revision, but I have replaced the example with one based on Zinger's suggestion and one from pro play. Caern: Explain " is a tesuji" plz. Bob McGuigan: is a clever move that is far from obvious since leads to the capture of . But these three black stones are now short of liberties and Black can no longer play at a as a local ko threat. If he does then White plays atari at b and captures the two black stones at and a or the three black stones including by playing atari at c.